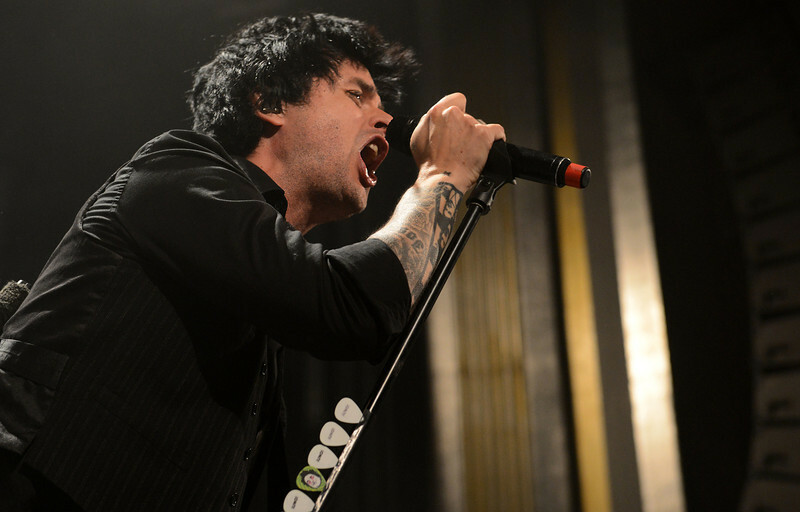 POMONA – Green Day lead singer and guitarist Billie Joe Armstrong showed no ill effects after taking a recent hiatus for rehab at the Fox Theater on Sunday night. The singer wore black but a constant smile, rapidly moved across the stage and frequently thrust his guitar in the air. The Grammy Award winning punk and alternative rock band, famously features bassist Mike Dirnt and drummer Tré Cool besides guitarist Jason White. Armstrong’s hiatus was the result of reportedly using prescription pills and alcohol which resulted in a rant when Green Day played the Las Vegas’ iHeartRadio Music Festival on Sept. 21 and cut short the set. The Oakland artist went into rehab two days later. Juan Bernal, 21, of Ontario said Sunday night’s show was his first time seeing the band and he was in line outside the Fox at 8 a.m.
Karen Reta, 54, of Tustin, said she watched Armstrong at the Las Vegas music festival where he went on his rant and said he sounded better.